America is not a paragon of democracy in the modern world. America is not as democratic as it claims to be. As Seán P. Twomey describes in his new book, “Is America Ready for Democracy? 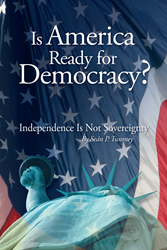 : Independence is not Sovereignty,” America’s definition of democracy has fatal flaws. He believes that obedience to government does not justify anything. This conflicts with the oath required to be a U.S. citizen, which removes the role of an individual’s conscience when given a military command by the government. Twomey is unique in that he may be one of the few people ever denied U.S. citizenship and re-granted his green card. This was because he refused to take the Oath of Allegience as written, believing that it contained language contradictory to true democracy. He is passionate in his commitment to these ideals. In his book, Twomey takes these beliefs and expands upon classic political philosophers like John Locke and Jean-Jacques Rousseau to find applications that are relevant in the modern age and break new ground. Seán P. Twomey is a retired professor of philosophy and a political scientist who believes that nothing can be justified solely through obedience to government. He has written two books, the first titled “The Right to Birth?”.